Aerospace engineering is the primary field of engineering concerned with the development of aircraft and spacecraft. It has two major and overlapping branches: aeronautical engineering and astronautical engineering. Avionics engineering is similar, but deals with the electronics side of aerospace engineering. Aeronautical engineering was the original term for the field. As flight technology advanced to include craft operating in outer space (astronautics), the broader term "aerospace engineering" has come into common use. Aerospace engineering, particularly the astronautics branch is often colloquially referred to as "rocket science". Flight vehicles are subjected to demanding conditions such as those caused by changes in atmospheric pressure and temperature, with structural loads applied upon vehicle components. Consequently, they are usually the products of various technological and engineering disciplines including aerodynamics, propulsion, avionics, materials science, structural analysis and manufacturing. The interaction between these technologies is known as aerospace engineering. Because of the complexity and number of disciplines involved, aerospace engineering is carried out by teams of engineers, each having their own specialized area of expertise. The origin of aerospace engineering can be traced back to the aviation pioneers around the late 19th to early 20th centuries, although the work of Sir George Cayley dates from the last decade of the 18th to mid-19th century. One of the most important people in the history of aeronautics, Cayley was a pioneer in aeronautical engineering and is credited as the first person to separate the forces of lift and drag, which are in effect on any flight vehicle. Early knowledge of aeronautical engineering was largely empirical with some concepts and skills imported from other branches of engineering. Scientists understood some key elements of aerospace engineering, like fluid dynamics, in the 18th century. Many years later after the successful flights by the Wright brothers, the 1910s saw the development of aeronautical engineering through the design of World War I military aircraft. Between World Wars I and II, great leaps were made in Aeronautical Engineering. The advent of mainstream civil aviation greatly accelerated this process. Notable airplanes of this era include the Curtiss JN 4, the Farman F.60 Goliath, and Fokker trimotor. Notable military airplanes of this period include the Mitsubishi A6M Zero, the Supermarine Spitfire and the Messerschmitt Bf 109 from Japan, Great Britain, and Germany respectively. A significant development in Aerospace engineering came with the first Jet engine-powered airplane, the Messerschmitt Me 262 which entered service in 1944 towards the end of the second World War. A fighter jet engine undergoing testing. The tunnel behind the engine allows noise and exhaust to escape. Radar cross-section – the study of vehicle signature apparent to Radar remote sensing. Fluid mechanics – the study of fluid flow around objects. Specifically aerodynamics concerning the flow of air over bodies such as wings or through objects such as wind tunnels (see also lift and aeronautics). Astrodynamics – the study of orbital mechanics including prediction of orbital elements when given a select few variables. While few schools in the United States teach this at the undergraduate level, several have graduate programs covering this topic (usually in conjunction with the Physics department of said college or university). Statics and Dynamics (engineering mechanics) – the study of movement, forces, moments in mechanical systems. Mathematics – in particular, calculus, differential equations, and linear algebra. Electrotechnology – the study of electronics within engineering. Propulsion – the energy to move a vehicle through the air (or in outer space) is provided by internal combustion engines, jet engines and turbomachinery, or rockets (see also propeller and spacecraft propulsion). A more recent addition to this module is electric propulsion and ion propulsion. Control engineering – the study of mathematical modeling of the dynamic behavior of systems and designing them, usually using feedback signals, so that their dynamic behavior is desirable (stable, without large excursions, with minimum error). This applies to the dynamic behavior of aircraft, spacecraft, propulsion systems, and subsystems that exist on aerospace vehicles. Aircraft structures – design of the physical configuration of the craft to withstand the forces encountered during flight. Aerospace engineering aims to keep structures lightweight and low-cost while maintaining structural integrity. Materials science – related to structures, aerospace engineering also studies the materials of which the aerospace structures are to be built. New materials with very specific properties are invented, or existing ones are modified to improve their performance. Solid mechanics – Closely related to material science is solid mechanics which deals with stress and strain analysis of the components of the vehicle. Nowadays there are several Finite Element programs such as MSC Patran/Nastran which aid engineers in the analytical process. Aeroelasticity – the interaction of aerodynamic forces and structural flexibility, potentially causing flutter, divergence, etc. Avionics – the design and programming of computer systems on board an aircraft or spacecraft and the simulation of systems. Software – the specification, design, development, test, and implementation of computer software for aerospace applications, including flight software, ground control software, test & evaluation software, etc. Risk and reliability – the study of risk and reliability assessment techniques and the mathematics involved in the quantitative methods. Noise control – the study of the mechanics of sound transfer. Aeroacoustics – the study of noise generation via either turbulent fluid motion or aerodynamic forces interacting with surfaces. Flight test – designing and executing flight test programs in order to gather and analyze performance and handling qualities data in order to determine if an aircraft meets its design and performance goals and certification requirements. The basis of most of these elements lies in theoretical physics, such as fluid dynamics for aerodynamics or the equations of motion for flight dynamics. There is also a large empirical component. Historically, this empirical component was derived from testing of scale models and prototypes, either in wind tunnels or in the free atmosphere. More recently, advances in computing have enabled the use of computational fluid dynamics to simulate the behavior of the fluid, reducing time and expense spent on wind-tunnel testing. Those studying hydrodynamics or Hydroacoustics often obtained degrees in Aerospace Engineering. Additionally, aerospace engineering addresses the integration of all components that constitute an aerospace vehicle (subsystems including power, aerospace bearings, communications, thermal control, life support, etc.) and its life cycle (design, temperature, pressure, radiation, velocity, lifetime). Aerospace engineering may be studied at the advanced diploma, bachelor's, master's, and Ph.D. levels in aerospace engineering departments at many universities, and in mechanical engineering departments at others. A few departments offer degrees in space-focused astronautical engineering. Some institutions differentiate between aeronautical and astronautical engineering. Graduate degrees are offered in advanced or specialty areas for the aerospace industry. A background in chemistry, physics, computer science and mathematics is important for students pursuing an aerospace engineering degree. The term "rocket scientist" is sometimes used to describe a person of great intelligence since rocket science is seen as a practice requiring great mental ability, especially technically and mathematically. The term is used ironically in the expression "It's not rocket science" to indicate that a task is simple. Strictly speaking, the use of "science" in "rocket science" is a misnomer since science is about understanding the origins, nature, and behavior of the universe; engineering is about using scientific and engineering principles to solve problems and develop new technology. However, "science" and "engineering" are often misused as synonyms. ^ "Required Education". study.com. Retrieved 2015-06-22. ^ "Education, Aerospace Engineers". myfuture.com. Retrieved 2015-06-22. ^ Encyclopedia of Aerospace Engineering. John Wiley & Sons, 2010. ISBN 978-0-470-75440-5. ^ a b Stanzione, Kaydon Al (1989). "Engineering". Encyclopædia Britannica. 18 (15 ed.). Chicago. pp. 563–563. ^ "Career: Aerospace Engineer". Career Profiles. The Princeton Review. Archived from the original on 2006-05-09. Retrieved 2006-10-08. Due to the complexity of the final product, an intricate and rigid organizational structure for production has to be maintained, severely curtailing any single engineer's ability to understand his role as it relates to the final project. ^ "Sir George Cayley". ?. Retrieved 2009-07-26. Sir George Cayley is one of the most important people in the history of aeronautics. Many consider him the first true scientific aerial investigator and the first person to understand the underlying principles and forces of flight. ^ "Sir George Cayley (British Inventor and Scientist)". Britannica. n.d. Retrieved 2009-07-26. English pioneer of aerial navigation and aeronautical engineering and designer of the first successful glider to carry a human being aloft. ^ "Sir George Cayley". U.S. Centennial of Flight Commission. Retrieved 31 January 2016. A wealthy landowner, Cayley is considered the father of aerial navigation and a pioneer in the science of aerodynamics. He established the scientific principles for heavier-than-air flight and used glider models for his research. He was the first to identify the four forces of flight--thrust, lift, drag, and weight—and to describe the relationship each had with the other. ^ Kermit Van Every (1988). "Aeronautical engineering". Encyclopedia Americana. 1. Grolier Incorporated. ^ "A Brief History of NASA". NASA. Retrieved 2012-03-20. ^ "Science: Engineering: Aerospace". Open Site. Retrieved 2006-10-08. ^ Gruntman, Mike (September 19, 2007). "The Time for Academic Departments in Astronautical Engineering". AIAA SPACE 2007 Conference & Exposition Agenda. AIAA SPACE 2007 Conference & Exposition. AIAA. Archived from the original on October 18, 2007. ^ "Aircraft Structures in Aerospace Engineering". Aerospace Engineering, Aviation News, Salary, Jobs and Museums. Archived from the original on 2015-11-09. Retrieved 2015-11-06. ^ "Entry education, Aerospace Engineers". myfuture.com. Retrieved 2015-06-22. ^ a b Petroski, Henry (23 November 2010). "Engineering Is Not Science". IEEE Spectrum. Retrieved 21 June 2015. Science is about understanding the origins, nature, and behavior of the universe and all it contains; engineering is about solving problems by rearranging the stuff of the world to make new things. ^ Neufeld, Michael. 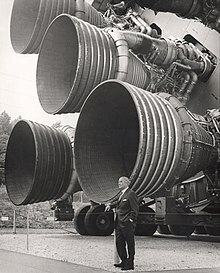 Von Braun: Dreamer of Space, Engineer of War (First ed.). Vintage Books. pp. xv. There has been a deep-rooted failure in the English-speaking media and popular culture to grapple with the distinction between science and engineering. Dharmahinder Singh Chand. Aero-Engineering Thermodynamics. Knowledge Curve, 2017. ISBN 978-93-84389-16-1. 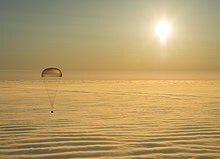 Wikimedia Commons has media related to Aerospace engineering. Kroo, Ilan. "Aircraft Design: Synthesis and Analysis". Stanford University. Archived from the original on 23 February 2001. Retrieved 17 January 2015. This page was last edited on 15 April 2019, at 18:50 (UTC).